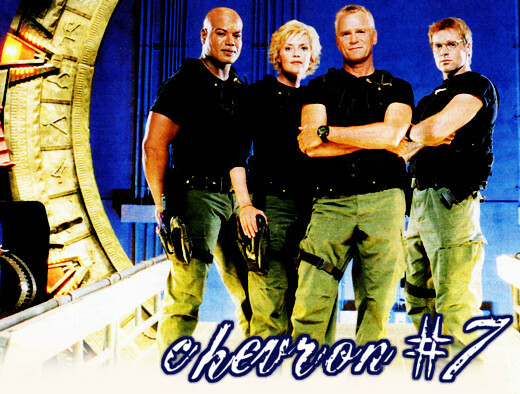 Welcome to Chevron #7, the Fanlistings Network approved fanlisting for the science fiction TV series Stargate SG-1. Stargate SG-1 was based on the 1994 movie Stargate and ran for ten seasons from 1997 through 2007; it was followed by two DVD movie continuances. A spin-off TV show, Stargate Atlantis, ran from 2004 until 2009, and a second spin-off series, Stargate Universe, begain airing in 2009. The Stargate is a piece of alien technology that has the ability to transport people across galaxies to other planets. The stargates were originally used to transport humans from Earth to other planets as slaves and hosts for a parasitic race known as the Goa'uld. The humans of Earth rebelled against the Goa'uld and buried their stargate, which was later discovered in the early 1900s in Egypt. A classified section of the United States Air Force, Stargate Command (the SGC), now controls the Stargate and sends military teams through it to procure alien technology that can help Earth defend itself against enemies (primarily the Goa'uld) and to learn more about alien cultures. The flagship team of Stargate Command is known as SG-1 and initially consists of Colonel Jack O'Neill, Captain Samantha "Sam" Carter, Dr. Daniel Jackson, and Teal'c. In Season Six, Jonas Quinn becomes the fourth member of the team in place of Daniel, but Daniel later returns in Season Seven. In Season Eight, Jack steps down from SG-1 and Sam assumes command. In Season Nine, Lt. Col. Cameron Mitchell becomes leader of SG-1, with Sam, Daniel, and Teal'c, and in Season Ten, Vala Mal Doran joins the team.